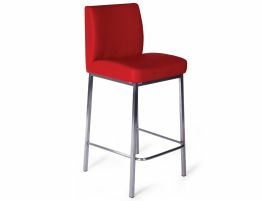 Maybe you are looking for a bar stool that is attractive without being fussy. Maybe you want a kitchen counter stool that looks expensive but wears well. The Vague barstool, here in chocolate brown, features an impeccable modern barstool design with a brushed stainless steel frame, an easy care fabric covered back and seat that has a leather like look and feel, non marking feet to protect your flooring, a half back seat that offers attractive styling without looking too heavy or bulky, and a gently sloped seat for lasting comfort. This fixed height breakfast bar stool offers an exceptional modern look at an affordable price. 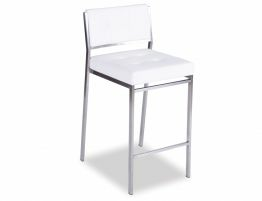 If you like the look of this modern kitchen barstool but are in search of other colour options, this style barstool is also available in black, cream and white. 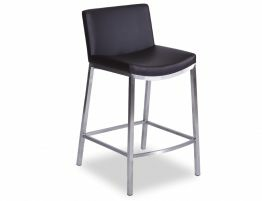 Our Ocean contemporary bar stool in chocolate offers the best of modern furniture design- it is chic, sleek with clean lines, premium materials and expert construction. Give your kitchen an instant update with new barstools. 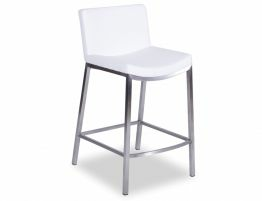 Your breakfast bar stools get a great deal of use so can be the first areas of your kitchen to show major wear. Without breaking the bank, you can buy brand new bar stools and instantly refresh this oft used space. 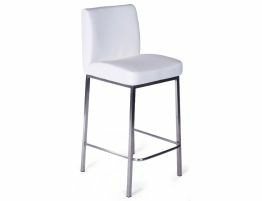 Get great deals on great furniture including a huge selection of contemporary bar stools like this one and more!